KACZMAREK INSURANCE SERVICES AGENCY, INC.. 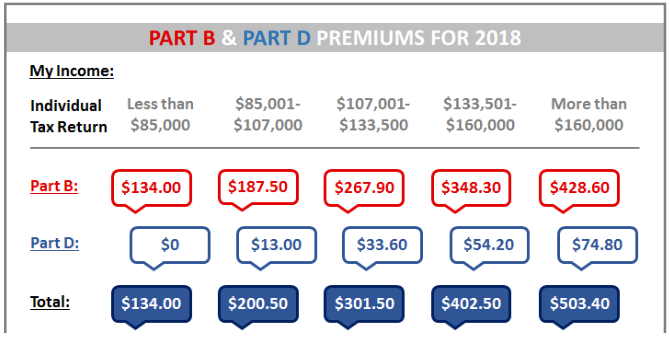 The 2018 Medicare Part B and Part D premiums are released annually in late November. Below is a chart showing the rates, which are calculated by Social Security based on Adjusted Gross Income. For two people, multiply by two. In some cases, Social Security sends a “initial” letter stating the beneficiary’s premium is the lowest amount of $134 a month but the person actually makes over $85,000. A few days later, the second letter arrives from Social Security stating the correct amount. Social Security also tries to bill so the person is on a quarterly payment schedule if he/she is not receiving Social Security. If a person is receiving Social Security, the Part B and possible Part D premium is deducted monthly from that payment. Kaczmarek Insurance Services Agency, Inc. (“KIS”) has been specializing in individual health care and employee benefit solutions for small business for over 35 years. We are advocates for free market health care and consumer health rights; serving over 150 employers and over 1,000 individual customers.